When the 2014 growing season arrives, it will be quite a relief after this cold winter! (Not that I'm complaining about the freezing temperatures. Low temps help with pest control as the cold kills off infestations). I thought you might appreciate a head start on your greens just in case the ground temperatures remain too cold for speedy germination. 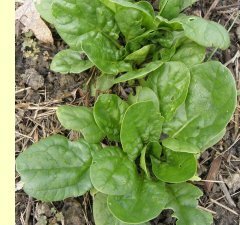 So I'm offering three types of arugula, four varieties of spinach, and three types of heirloom lettuce (romaine, oakleaf, and green leaf). See photos of most of the spring varieties. For your summer garden, I have a wide selection of tomatoes, peppers, tomatillos, culinary herbs and beneficial flowers. See photos of some of the summer varieties. In addition to the classic heirlooms, I'm offering several late blight-resistant tomato varieties. Read more about the benefits of these hybrids, developed right down the road in Mills River. I'm also trying out a few unique edibles and beneficial flowers new to my nursery, which you also have the option to reserve if you feel like experimenting. Find out more details when you request a full plant list by emailing gardens@wncmretc.com or calling 828.333.4151. 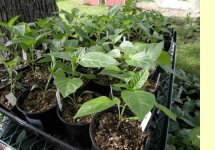 Spring seedling orders are due March 1 and summer transplant orders are due March 15. Plan on receiving your spring plants by April 1 and your summer plants by May 10. Payment is due when you pick up the plants at M R Gardens in Oakley (Southeast Asheville). Looking for brassicas? I'll be offering a wide selection of kale, broccoli, cabbage and other cool season crops for fall planting. Orders will be due June 14. There are lots of benefits to ordering your plants ahead of the season. Namely you receive the strongest, best-looking plants at the nursery. At M R Gardens, special attention is given to each of the seedlings, which are grown in organic potting soils in the healthiest environment possible. I trade seeds with Appalachian growers or buy from companies that have taken the Council for Responsible Genetics Safe Seed Pledge. In agriculture circles, I've often heard that new growers need to garden seven to ten years before they become proficient. Novice gardeners hear that and are like, what? Ten years? How am I going to fit that into my life? So they never try. 7) Hire a garden coach. This mentor will hold your hand and teach you step by step so you don't have to waste time researching things you really don't need to know at this moment in time. She has your best interest in mind and is committed to making this process fun, therapeutic, and rewarding. She'll help you design a system so that you can keep the things you like about your lifestyle, and the gardening time commitment won't feel like a sacrifice. In fact, with the addition of exercise in the garden, the feel of plants surrounding you, the rewards of harvesting your own produce, and delicious meals to share with friends and family, you'll feel nothing short of abundance. I don't want to be too discouraging about choices one through six. I learned via these routes, as do a lot of other advanced gardeners. But if I didn't want to go into this work professionally, I think I would have preferred option number seven. You can still interweave one through six into your self-education, even if you hire a coach. In fact, I encourage it. Any way you learn about growing your own nutritious food and adding more natives to the local area is good. But seven will save you time, money and frustration over the long run. I know because, if you're a novice eager to get started but torn between lots of other interests and activities, I've been where you are. You're envisioning a bountiful garden, gourmet meals, and a healthy lifestyle, but you're looking at your schedule wondering how in the world are you going to gain the time and the knowledge to get there. That's why I'm here to help. I am currently running a special for a $20 initial consultation, where I review your site and interview you so I can best understand your needs. We then discuss various packages that will work best for you. Oh, I should mention, there is an eighth choice. Gardening via your intuition. But that's a whole other topic I'll explore in a later article. The intention of M R Gardens is to open up gardening to all types of people—all ages, genders, backgrounds, belief systems, political leanings, resources, grimey-hands-aversion-levels, and hair styles (this last category will make more sense when you read this article). I've been excited that in my first couple years of garden coaching, my clientele have not fit into any one single demographic but instead are all across the board. I'm living proof that just about anyone can garden. Twenty years ago, I did not at all fit the typical image of a farmer. If you would have told me at age 15 that was going to be my profession, I would have laughed at you! At that time, I couldn't wait to move from the boredom of the cornfields to the diversity of the city. Granted, I'm a much different grower than the farmers I grew up around, but the more I interact with all types of farmers, the more I realize the commonalities between those of us who work the land are much greater than our differences. Read more about my path from cheerleader to gardener. If this former 80's material girl can become a professional grower, then anyone can have fun in the dirt. Like the government officials in Atlanta, I didn't take the snow predictions last month seriously. I didn't bother going to the supermarket when the Weather Service expected a few inches. 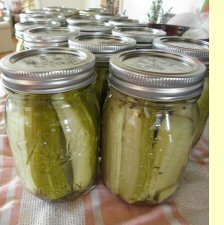 So for two and a half days, before the ice melted on my road and I could drive to the grocery, I lived on pickles that I canned last summer, soup from carrots and parsnips that I harvested two weeks prior to the storm, and odds and ends from my freezer. You might be thinking, "What a bland diet! ", but in fact the food was incredibly filling and nourishing. My garden produce was no longer a luxury but vital for my sustenance. I never felt more thankful and appreciative of what the soil right outside my back door can do. 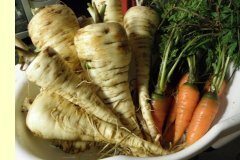 So I've added another reason to my growing list of why I garden: I don't have to frantically run to the supermarket when snow is predicted. My cupboards and freezers are already stocked with food I stored during last growing season. Read more reasons on the M R Gardens website. Pick the kinds of herbs you need in whatever amounts you want at an affordable price. Perennial herbs such as oregano, thyme and rosemary will be ready by April, and basil and other herbs will be available in the summer. View more photos for inspiration for your 2014 garden.